"Adam Green", "Barack Obama", "Bold Progressives", "Medicare", "PCCC", "Professional Left"
First of all, frankly, if Adam Green prefers Paul Ryan's position on Medicare (to end it) to the President's, then frankly, as far as us liberals and progressives are concerned, he knows where the door is. Secondly, this is a bold-faced lie. Not mis-speaking, not exaggeration, an out-and-out lie. Adam Green would like you not to have seen the President's press conference, of course, and just take his word for it. But luckily, we have both the video and a transcript available. But before I quote from it, let me say a word about this small contingent of followers that Green took to the Obama HQ in Chicago who he claims "volunteered and donated to Obama 2008"... dear Jake Tapper, I wouldn't print it without seeing donation receipts for every last one of them. I’ve laid out some criteria in terms of what would be acceptable. So, for example, I’ve said very clearly that we should make sure that current beneficiaries as much as possible are not affected. But we should look at what can we do in the out-years, so that over time some of these programs are more sustainable. I’ve said that means testing on Medicare, meaning people like myself, if -- I’m going to be turning 50 in a week. So I’m starting to think a little bit more about Medicare eligibility. (Laughter.) Yes, I’m going to get my AARP card soon -- and the discounts. But you can envision a situation where for somebody in my position, me having to pay a little bit more on premiums or co-pays or things like that would be appropriate. And, again, that could make a difference. So we’ve been very clear about where we’re willing to go. What we’re not willing to do is to restructure the program in the ways that we’ve seen coming out of the House over the last several months where we would voucherize the program and you potentially have senior citizens paying $6,000 more. I view Social Security and Medicare as the most important social safety nets that we have. I think it is important for them to remain as social insurance programs that give people some certainty and reliability in their golden years. But it turns out that making some modest modifications in those entitlements can save you trillions of dollars. And it’s not necessary to completely revamp the program. What is necessary is to say how do we make some modifications, including, by the way, on the providers’ side. I think that it’s important for us to keep in mind that drug companies, for example, are still doing very well through the Medicare program. And although we have made drugs more available at a cheaper price to seniors who are in Medicare through the Affordable Care Act, there’s more work to potentially be done there. So if you look at a balanced package even within the entitlement programs, it turns out that you can save trillions of dollars while maintaining the core integrity of the program. Let me see if this can't be put in a nutshell. Current beneficiaries would not be affected. Adam Green's claim that the President wants to cut benefits for current beneficiaries is a bold faced lie. People affected by means testing would only be for the well to do. Which, mind you, would have the effect of essentially taxing the rich more to use Medicare (as opposed to the Medicare payroll tax, which is regressive), and make Medicares benefits structure more progressive (here, progressive is not a matter of opinion but of math). I thought Adam Green wanted to tax the rich more. No? The reforms President Obama envisions strengthen the program, not end it. In a post coming up soon, I will cover, in detail and in context, Medicare reform that the President has eluded to. Far from cutting benefits, President Obama has in fact added to Medicare benefits through health care reform (by shrinking and eventually closing the prescription drug donut hole, by getting 50% discount on prices of drugs that fall into the donut hole until it actually is closed all the way, and by making preventive services free under Medicare). By the way, why is it that you never see these self-appointed defenders of Medicare never ever mention that? And oh by the way, President Obama is looking to do a lot of savings in Medicare on the provider side. Some of it was done in the ACA, but there is plenty more room. What the President is talking about there is cutting into the profit lines of the massive hospital and drug industries. Where is self-proclaimed progressive "champions" cheering him on? What is it I need to do for this to get through the thick heads of Adam green and the like? Circle those parts in crayon? Make no mistake about it. This is a calculated, nefarious and deliberate propaganda campaign. It involves lies because it is intentional. You cannot tell me that this guy doesn't know any better. The deception is deliberate and the lying should be clear as daylight to anyone in command of the facts. Green and his cadre would like to drive people off a cliff with soundbites, and his idea is to perform Fox-style campaigns to incapacitate progressive policy makers from doing any kind of reforms to our nation's social safety net in order to sustain it. What motivates it? I don't know. It may be that this is all he knows how to do - complain. It might be that bashing the President earns him loyalty of his followers (the same way the same thing earns Sarah Palin the loyalty of her followers). It may be that he's not done ripping off his donors for his own financial gain. It may be that his racist attempt to demean the President is not yet over and has now taken the-scary-black-man-is-out-to-get-you form. I don't know. What I do know is his lie, at this point is not just about the President and Medicare. His big lie is that he is a progressive at all. 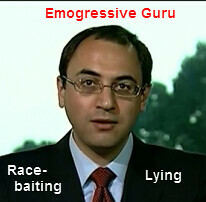 But the good news is that real progressives are onto this impostor and many others like him. Those of us who have understood that this President is on our side - proven through his policies - have fought back against the likes of Green, Hamsher, etc. We didn't have much resources, but we did have the truth on our side. It turns out that we on the disparate PragProg blogosphere weren't the only ones that stood by this President because he stood by us. And that has resulted in 552,462 donors (260,000 of them brand new donors), 680,000 donations, $86 million, and 300,000 conversations on behalf of the President's re-election campaign in three short months, a year and a half before the election, shattering all records. Yes, we will continue to expose the lies perpetrated by the faux-Left, but that must be our ultimate answer.